Makeover and refresh your bed and bedrooms every season with just a single touch! Start with these fun and decorative Pillow Shams. These unique designs match well with various color palettes of your duvet covers, comforters, rugs, curtains, headboard and all other decor accessories. Soft, cozy and easy to use with an envelope closure. Very durable and sustainable material which will not endanger your health or the environment. No chemicals used, No dye substance harming the health of you or your family, %100 recyclable environmentally friendly fabric. Colors won't fade thanks to new digital printing methods. Make a difference and change the look of your room, girls boys room, guest room, hotel room. Also a perfect gift idea for your mom, dad, sister, brother, grandma, wife, husband, daughter and son and all other beloved ones with many of surprising designs. You can find a design for everybody and every interest in our Ambesonne Amazon Collection. They will be shocked by the superior quality of the item when they open the present. Customized, personalized products are very popular. As manufacturers of digital printed home textiles, we follow current trends and bring you the latest home fashion. Either a gift to your family or friend, relative or boyfriend girlfriend, or to yourself, the item should be interesting and authentic. The digital images we display have the most accurate color possible, however due to differences in computer monitors, we cannot be responsible for variations in color between the actual product and your screen. Due to manual measurement, please kindly allow 1-2 cm discrepancy. Care Instructions: Machine wash with cold water; Do not bleach. Tumble dry on low heat. Iron on medium heat. The Pillow Sham is printed on the FRONT SIDE ONLY, the back of them are plain white colored. This is ONLY the Pillow Sham, sold WITHOUT the insert. 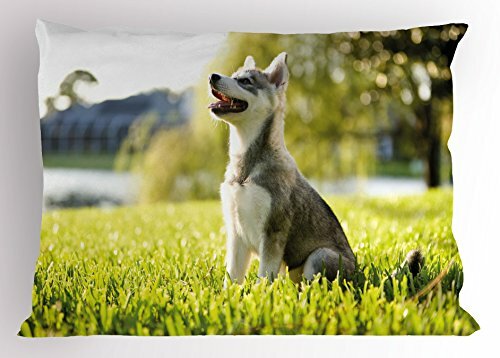 20 INCHES LONG x 36 INCHES WIDE - Only Pillow Sham, INSERT NOT INCLUDED. MADE FROM - 100% Brushed microfiber fabric. Super soft for ultimate comfort. Excellent workmanship. FEATURES - ENVELOPE CLOSURE to keep pillows snug. Vivid colors, Clear image, NO FADING. EASY TO CARE & USE - MACHINE WASHABLE on Delicate cycle, Dryer safe. Iron easy - No harmful dyes. PRINTED - With state of art digital technology. Sham is printed on FRONT SIDE ONLY. View More In Pillow Shams. If you have any questions about this product by Ambesonne, contact us by completing and submitting the form below. If you are looking for a specif part number, please include it with your message.